I discovered the secret to making crispy-on-the-outside/tempura-style silken tofu that you get in Japanese restaurants, without the actual deep-frying. And the secret is... Panko, aka Japanese bread crumbs. 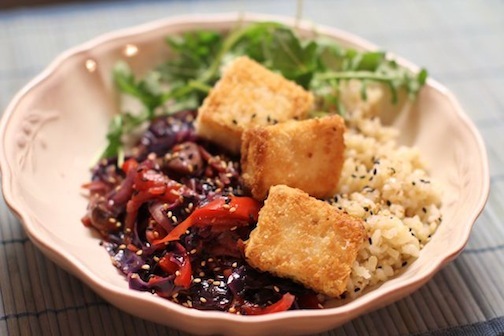 It's a revelation (if you like tofu, that is)! I came home from work yesterday and whipped up this colourful dish (with the help of my master-veggie chopping husband, of course), and we were both surprised by just how good it turned out. I mean, we always cook well, but when it comes to inventing recipes, it's always a gamble. Anyway this one is a keeper. And I'm so excited to have finally learned how to make Japanese-style crispy silken tofu. After all, vegetarian food is so darn healthy, we need a little fried stuff too once in a while! Mix the panko, flour & salt in a shallow bowl, and place the egg in a separate bowl (lightly beaten). Piece by piece, gently dip a tofu cube in egg, then in the panko mixture (rolling it around to cover each side). Then place in the hot frying pan. Repeat with the remaining cubes. Turn the tofu cubes gently so that each side turns a nice, golden brown. Then place on paper towels to drain off excess oil. 3 medium (or 2 large) carrots, coarsely grated. Saute the onion in olive oil until softened slightly. Then add the shredded cabbage and carrots and sesame oil. Saute over medium heat for about 5 minutes, then add the bell pepper and garlic. Add the remaining ingredients and continue to cook over gentle heat until the cabbage has softened. Adjust seasoning to taste (It's hard for me to quantify exactly what I do when I cook, I'm always adding a little splash of this, a little dash of that... you have to have fun in the kitchen and trust your instincts!). I served this with brown rice and a little arugula on the side, topped with cubes of crispy fried tofu and garnished with toasted sesame seeds. It was DELICIOUS!! I love Japanese bread crumbs! They really do hold up better and make a great texture. This looks delicious! Nicely cooked tofu is always a special treat for me, since it seems so daunting to do at home. I'm not a good cook. I remember in Winnipeg there was a vegetarian restaurant called Mondragon that did a Southern Fried Tofu Sandwich that was to die for. Sort of like shake and bake pressed tofu. Tofu can be so delicious! This recipe was so amazing!!! 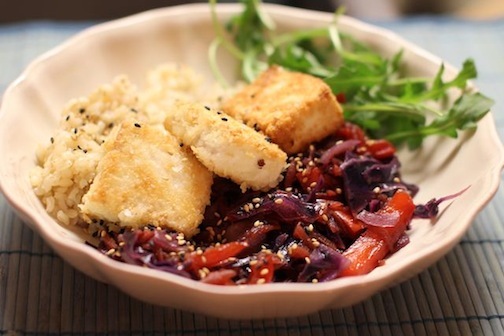 I added sesame seeds to the Panko flakes and a little bit of pepper, I often cook with tofu but this recipe was so good...it`s a keeper for sure! And it worked really well with HOISIN sauce!I cooked brown rice and veggie with it but next time I will try your cabbage side dish. Thanks for the discovery!